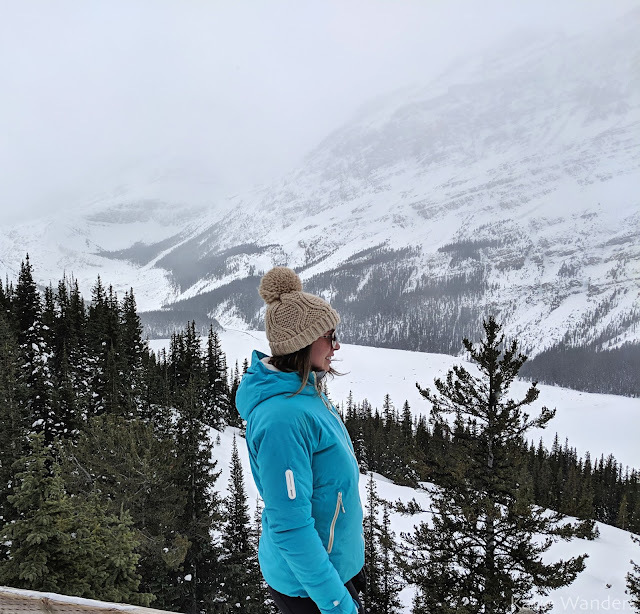 On Friday, we headed northwest to drive down the beautiful Icefields Parkway, a 232 km (144-mile) stretch of winding road connecting Lake Louise and Jasper while traveling through incredible scenery along the Continental Divide. Of all the spots in Canada (and with winter weather on the forecast) why here you may be wondering? This drive along the double-lane highway has been called one of the top drives in the world by Condé Nast Traveller and I was eager to see this beauty for myself. What should you expect to see? 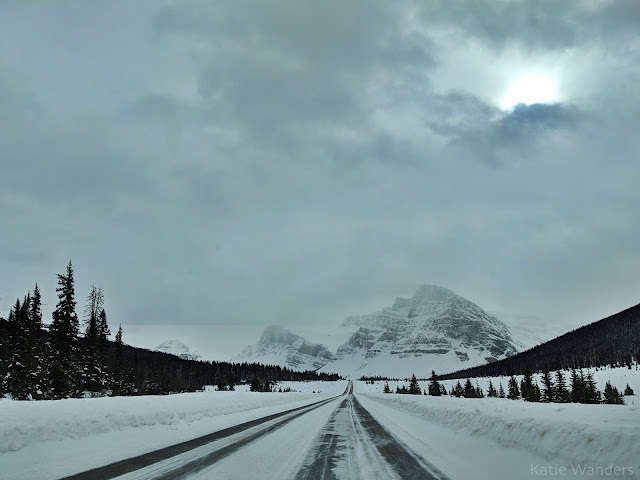 It depends on the season but along this stretch of road there are over 100 glaciers, cascading waterfalls, rock formations, and famous to Banff - expansive turquoise lakes sitting in pine and larch forests (if you are wondering what a larch is you aren't alone -a larch is type of conifer). In the winter expect to see a whole lot of snow and very few people out on the road. In fact, you are lucky if you even really see the road under all that snow while traveling this beautiful stretch of Canadian Highway. With that being said, obviously do your research and check the weather but in February the roads were plowed enough, and properly sanded. Like most winter driving, as long as you pay attention and drive slow, you should have no problem crossing this highway. When traveling in any wintry climate, an SUV with 4WD is always a good idea. First things first, we needed some maps, information, and snowshoes. The National Parks people recommended Snowtips for rentals and for just $7 each for half a day (6 hours), we grabbed some snow shoes and headed north. The plan was to conquer two hikes in one day- both relatively short with some driving involved. 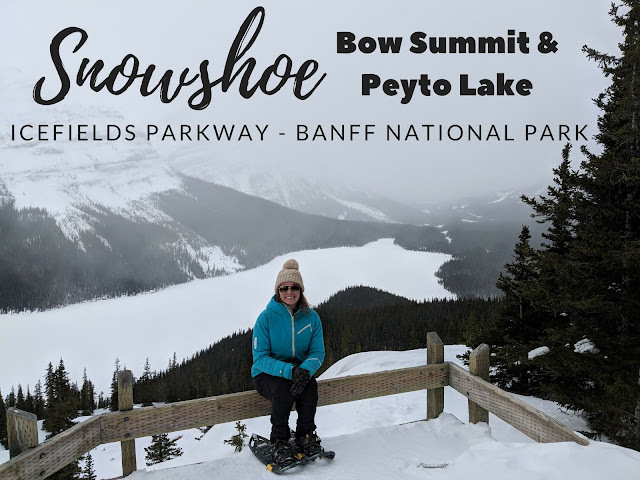 To start the day, we headed for the Bow Summit trailhead on the Icefields Parkway for a beginner friendly snowshoe to the Peyto Lake viewpoint. There are many famous stops and overlooks along the parkway, some open and some closed during the winter months. We were glad we grabbed a map at the National Park station but if you forgot, you can view one online. 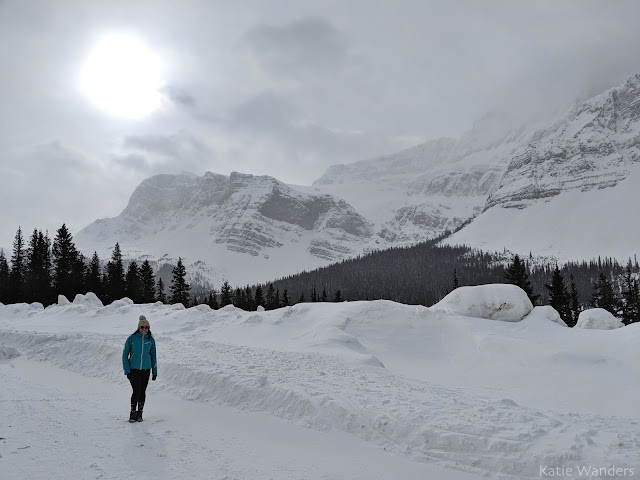 We stopped at a few to take in the incredible scenery and enjoy the utter quietness of the Canadian Rockies in February. 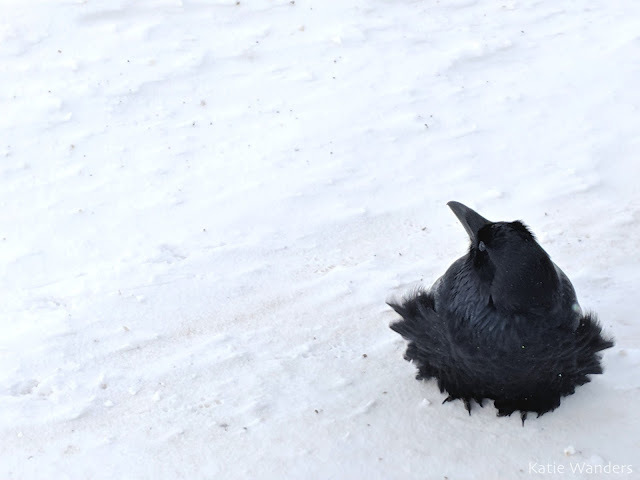 Nothing around us but the occasional car driving by and a few pesky ravens who unfortunately seemed far too accustomed to being fed (#LetThemBeWild). 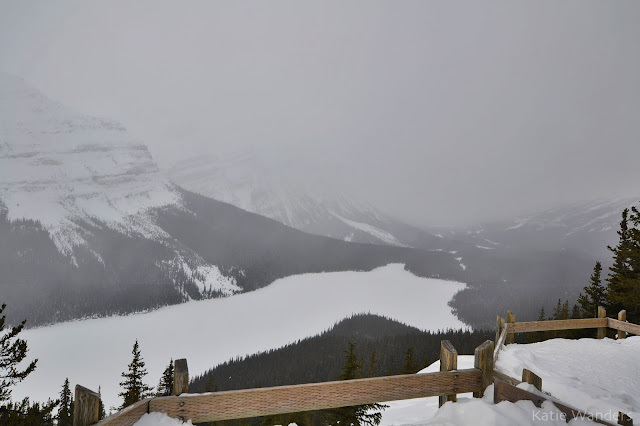 We stopped at a few overlooks, surprised to see some of them (including Bow Lake and Bow Summit) even had open bathrooms this time of year - way to be Canada. 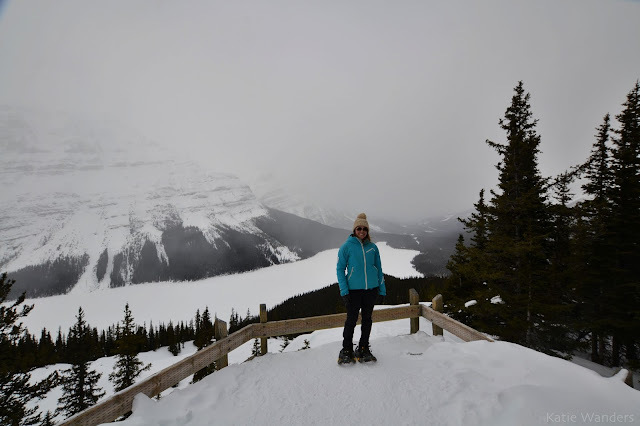 Our final destination was the Bow Summit trailhead so we could snowshoe over to the famous overlook of Peyto Lake. Peyto Lake is one of those famously popular spots in Banff, known for its fantastic vista, highpoint, and incredibly easy access. 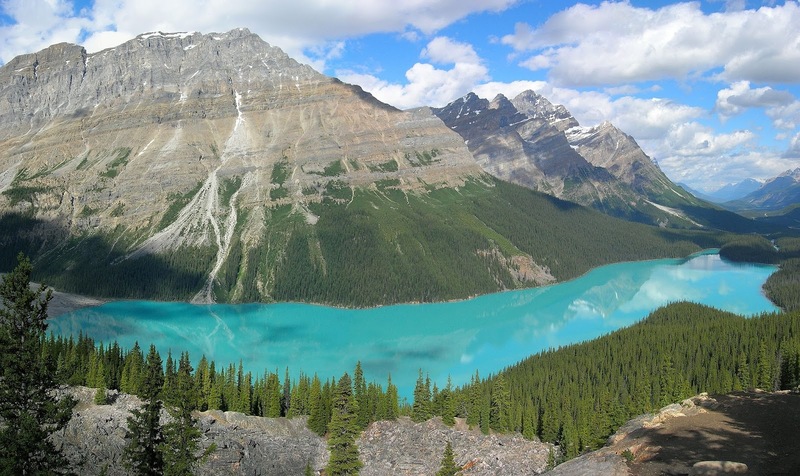 The lake is the most visited and photographed in the Canadian Rockies due to its bright turquoise color, a result of glacial rock flour (suspended rock particles) that flows into the lake. Everything I read about this trail said "just follow the masses" it's that popular- I'm talking has its own tour bus entrance type of busy. 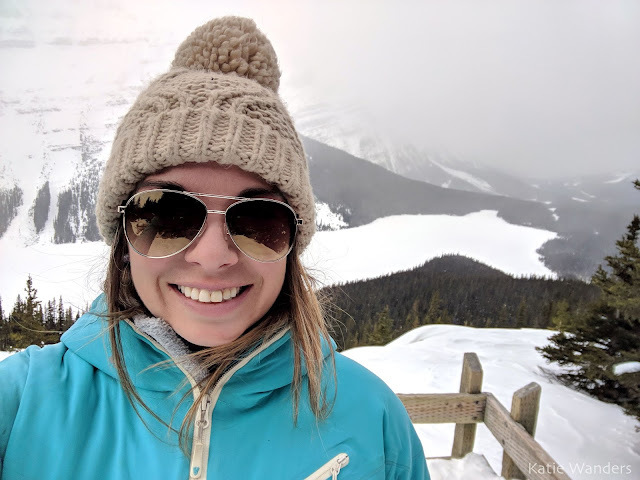 Bow Summit (this view overlook of Peyto Lake) is the highest point (2,088 m/6,800 ft) along the Icefields Parkway and is in fact, the highest elevation crossed by a public road in Canada. Famous lake, highest point, standing on a summit with relatively little effort.... it is an attraction ideal for the masses. During the summer, tour busses bring visitors to the upper parking lot where from there, its a five minute walk to this vista. And take it from me, the shorter the trail the more crowded they tend to be. Don't get me wrong, I am glad some of our open spaces are so easy to access, getting more people of different abilities out in nature (you have to see these places to love them, to protect them). And truth be told I am dying to come back in the summer to see this lake in it's glory shimmering an unnatural hue of blue but for now, I really enjoyed the solitude outside of the busy summer months. In the winter, this "tour bus road" is closed and you hike in from the lower parking lot, adding about 20 minutes onto your snowshoe. If you want to thin the herd, an uphill trek up a snow covered roads in single digit temperature will do the trick. 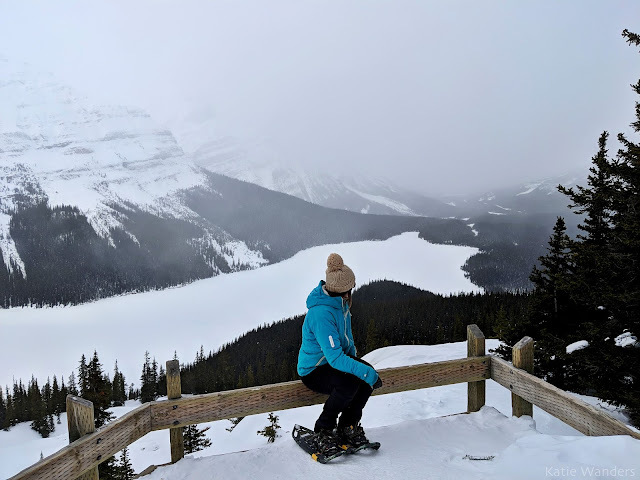 If you visit Peyto Lake in the winter, hike in and have a seat, enjoying the quiet, the solitude, and of course the view - you have the place to yourself. 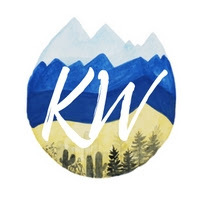 I traded turquoise water, warm weather, and crowds for absolute quiet reflection on a chilly day, overlooking a snow covered lake and I am quite happy with my decision. The drive was relatively easy as the Parkway consisted of packed snow. The dry snow has good traction and as long as you are cautious and watch your speed, the road was easy to drive. I sort of joked that I don't think I saw pavement once this trip. It keeps snowing in Banff and the plows keep plowing. But they don't get plowed down to asphalt like they do here, just packed with more snow and gravel and sand is added for traction. To get to the trailhead, travel north on the Icefields Parkway - also known as Highway 93N - for about 30 minutes. 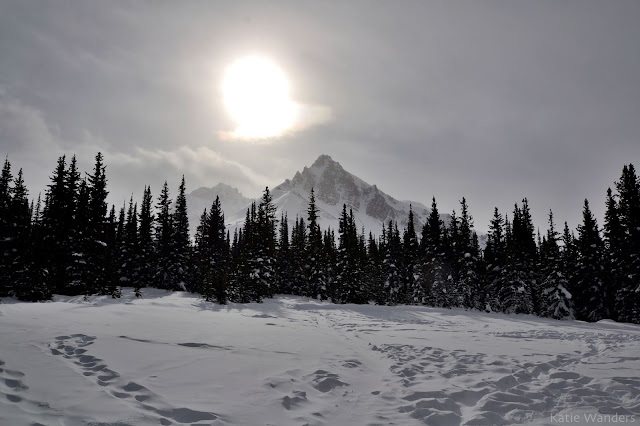 After you pass beautiful Bow Lake, keep your eyes open and as you want the next turn, Bow Summit. Once you turn off the parkway at the Bow Summit entrance, you will see the lower parking lot on the right. 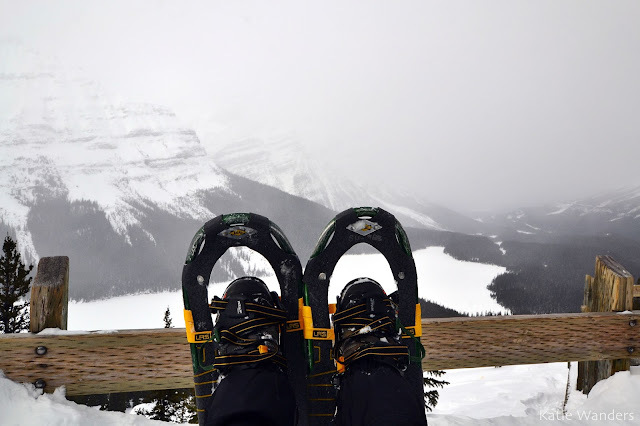 This snowshoe is beginner friendly. It is approximately 20 minutes each way up a slight incline. 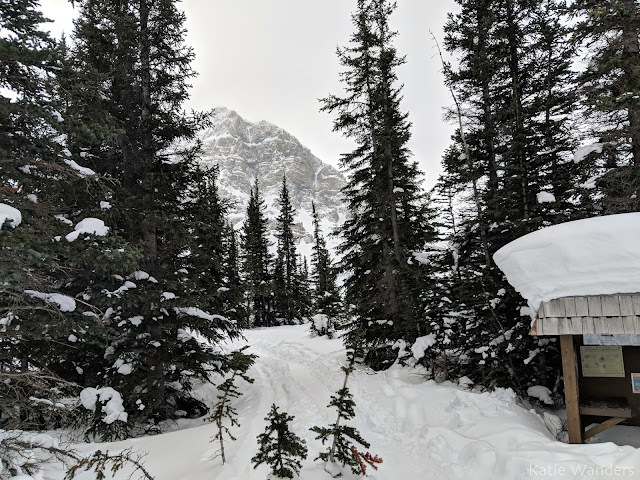 To start, park at the trailhead and follow the paved bus route (or more likely tracks, hopefully snow covered at this point) and take a right onto the paved trail (again, snowy tracked trail in February). 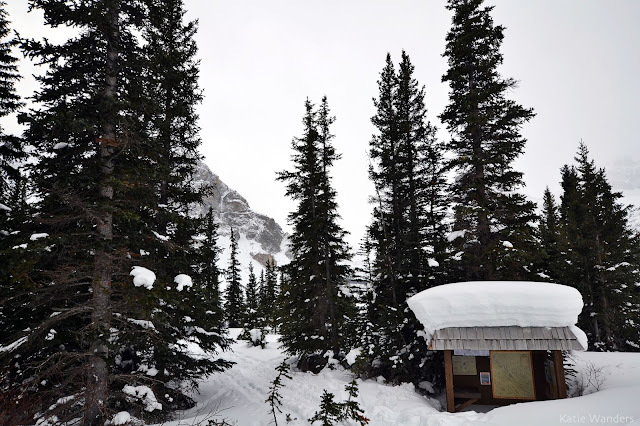 At the lower parking lot, there is a posted trail map and bathroom (open in the winter!). 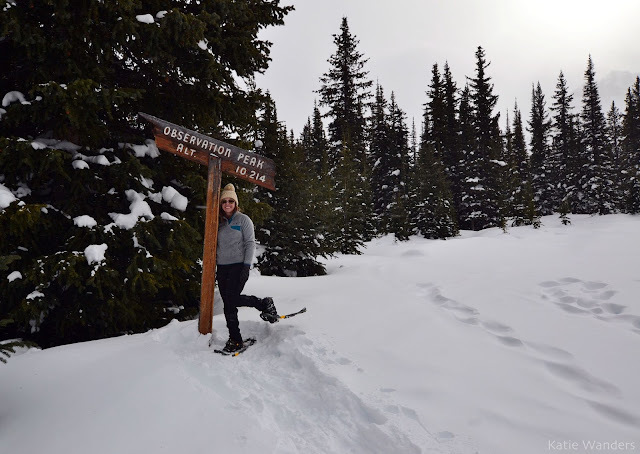 The trail could have been done in just snow boots and gaiters but the snowshoes made the trek a whole lot easier, and a ton of fun. In Connecticut, it's rare to get enough snow around long enough to plan snowshoeing trips - you have to head to the mountains for the good stuff. To sum it up, days like this one will stay imprinted on my travel logged brain for a while. It is one of those places that are so iconically beautiful, and so few people make the trek to see in the winter months which in my opinion, entirely adds to the beauty. Its a day spent in Alberta Canada, on a scenic long drive through a quiet part of the Canadian Rockies. Miles of snow covered mountains, glaciers, overlooks, and Billy Joel on the radio sets you up for success. 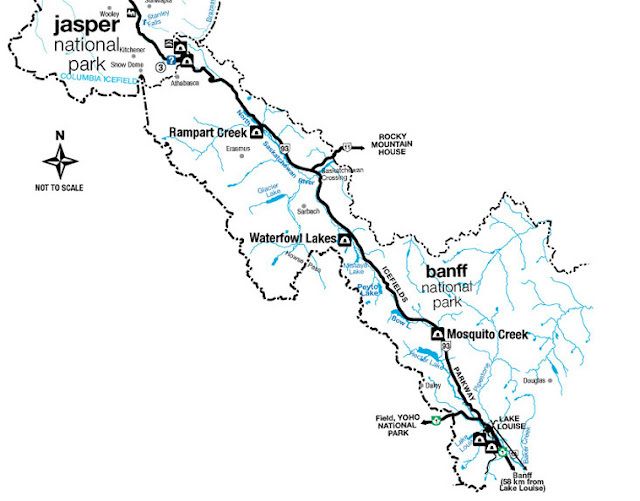 Given the time, I would have loved to drive the entire parkway, linking Banff to its neighboring National Park, Jasper. Its one of those road trips where the views from the warmth of my rental car were almost as good as the ones I strapped on snowshoes to go see. 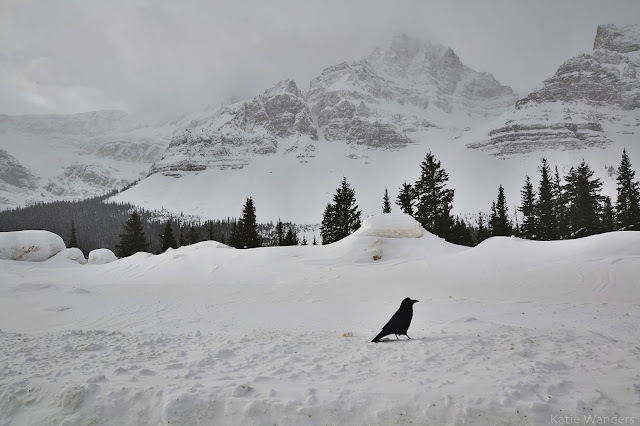 Winter, summer, anytime is a great time to see the Icefields Parkway. If warm weather and that unique blue is on your mind, then try for the summer or one of the shoulder seasons. Whatever you choose, you are in for an absolute treat. But for complete abandon and solitude, head to the parkway in the winter, you will not be dissapointed. Ah. This is what I've been waiting to see - Katie on snowshoes. I hope you really liked it. I have found it great fun.